Explore south-west Crete on this self-guided walking holiday that takes in an impressive coastline, the beautiful White Mountains and the famous Samaria Gorge. Hike at your own pace and enjoy the changing scenery of natural beaches, fir forests, mountains and gorges. Accessible from both of Crete's airports by public transport or taxi, your first two nights' accommodation is in the small seaside town of Paleochora, on Crete's south-west coast. After checking in to your friendly hotel you may have time to take a stroll around this pleasant town, exploring its Venetian fortress and beaches. In the morning you will be taken by taxi to the village Azogires where your walk starts along the 'Monastery of the 99 Monks'-trail. You will encounter a variety of scenery today including olive groves, the quiet hill top village of Anidri with a Byzantine church and the popular school house tavern, the small gorge of Anidri, the tranquil beach of Gialiskari and a coastal stretch back into Paleochora. You may swim before going back to your hotel. From June to September you may opt for the alternative program for today, including a relaxing ferry journey from Paleochora to the enchanting Elafonissi Lagoon, from where you walk back towards Paleochora along the coast. The ferry runs daily except Sundays from June to September. En route, you will pass beautiful, remote sandy beaches - ideal spots from which to enjoy a refreshing dip. The walk ends at Kryos Beach, where a taxi will pick you up for the transfer back to your hotel. 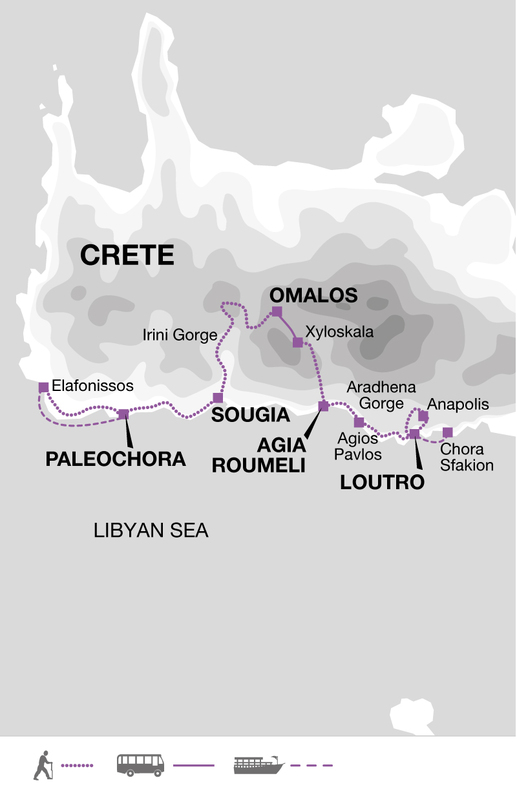 If the ferry is not running, a taxi will take you to Azogires from where you will walk down to Paleochora. You can expect both of today's 10 kilometre walks to take approximately three to four hours. Today's walk starts from your hotel, following a dirt track into an undisturbed natural wilderness, before continuing along a stunning coastal path overlooking the sea. You will pass ancient Lissos - an important harbour for the Dorian city of Elyros, which boasted a population of 30,000 at it's peak. In ancient times, people came to Lissos to be cured by the local waters. You can enjoy a picnic lunch on this historic spot and swim in the curative waters before continuing your journey east. The final part of the trek takes you along a spectacular and narrow gorge to the small and laidback seaside resort of Sougia. Here, your night's accommodation is positioned just 200 metres from the beach. You can expect today's 15 kilometre walk to take approximately five hours. Today, you traverse two impressive gorges, from sea level up to 1000 metres. The first part of your walk takes you through the impressive Irini Gorge along a well-made path. The ascent is demanding but not too steep. You then head into the steeper Figou Gorge, from which stunning views can be enjoyed in the higher sections. The walk ends at a chapel, 'Agios Theodoros', where the hotel minibus will pick you up. Tonight's accommodation is on the Omalos Plateau, surrounded by the spectacular summits of the White Mountains. Depending on the route you take today's walk will be between 12 and 21 kilometres, and take approximately six to eight hours. Today's walk takes you through Europe's longest and most famous gorge - the Samaria Gorge. You can either start very early or later in the day, avoiding the crowds of people who walk the gorge as a day trip. During quieter hours, you'll enjoy the true beauty of this spectacular gorge all the more. You will be transfered to Xyloskala, the entrance of the gorge, and the start of your walk. Please note that the Samaria Gorge is usually closed until the end of April - Opening depends on the amount of rain the area is receiving. At any time of year if there is heavy rain the Gorge can also be closed. In this event arrangements will be made for you to travel to Sougia and take the ferry from Sougia to Agia Roumeli. From there, there is a optional walk to the 'Kastro' (approximately 10km). Tonight's accommodation in the seaside village of Agia Roumeli is positioned at the very end of the gorge, which leaves you as much time as you need for the walk. No organised trips to the gorge include an overnight stay here, so it remains peaceful in the evenings. Your modern style accommodation is just 200 metres from the beach. Upon arrival, you may choose to have a relaxing swim in the crystal-clear Libyan Sea, before enjoying dinner at one of the local taverns. You can expect today's 16 kilometre walk to take approximately five to six hours. Today's splendid coastal walk offers lots of variety. After walking along the beach to the Byzantine church of Agios Pavlos, you then take a higher elevation through fir forest, before continuing on to the beach at Marmara. You may choose to relax at the tavern here, enjoying the views of the mountains and the sea, before your final hour's walk along the coast to the car-free village of Loutro. Widely regarded as one of the most romantic villages on Crete, it is only accessible by boat and on foot and will be your base for the last two nights of your holiday. Your pension accommodation here overlooks the surrounding white-washed houses, mountains and sea. You can expect today's 15 kilometre walk to take approximately five to six hours. Today's circular route starts with a steep zig-zag path up to the village of Anopolis. From here, you walk further on to ancient Aradhena, situated at the edge of the impressive Aradhena Gorge. You then follow a spectacular path down into the Aradhena Gorge and all the way to the coast. The last leg of your walk takes you along the coast back to Loutro. As an alternative, it is possible to do a shorter version of this walk, via the tiny village of Livaniana, before descending into the Aradhena Gorge. If you are leaving Crete tomorrow depending on your flight departure time, you may need to travel back to Chora Sfakion by ferry today, for your return to Chania or Heraklion Airport. 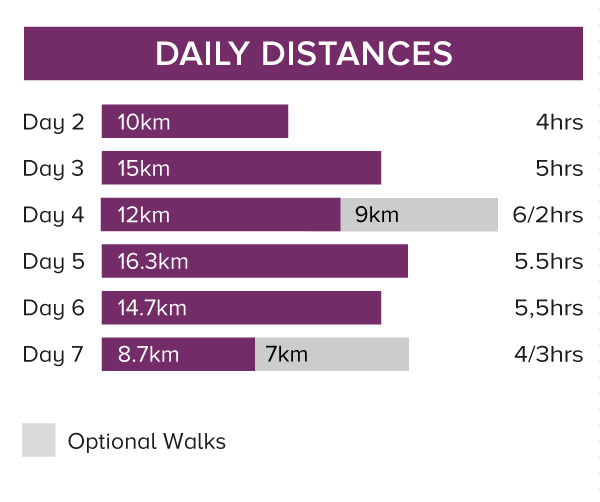 You can expect today's 16 or 9 kilometre walk to take approximately seven or four hours, respectively. After returning to Chora Sfakion by ferry, you have the choice between returning to Chania or Heraklion Airport by pre-booked transfer or public transport. Light clothes suitable for walking in warm weather are recommended. However early and late in the season (May/Juneeptember/ October) also bring warm clothing in case of drops in temperature or the odd shower. In high places like Omalos nights can be cold, so a fleece jacket is a good thing to have at any time of year. Bring one main piece of baggage as per your airline luggage allowance, maximum 20 kg per person. Remember you are expected to carry your own luggage during transfers by public transport so don't overload yourself. Luggage transfers between hotels are normally arranged by the hoteliers. Mark your bags clearly and leave them at the place and time arranged with them. Luggage transfers may be done using ferries rather than vehicles, but again the hoteliers will manage this. (If the ferry between Sougia and Agia Roumeli is not running but the Samaria Gorge is open then it may be necessary to carry one nights essentials with you). When travelling on public transport or on a ferry you should always take your luggage with you. Please note: 2 x 1:25,000 maps are provided on arrival in your welcome pack. These cover Samaria-Sougia-Paleochora and Lefka Ori-Sfakia / Pachnes. Entrance fee for the Samaria Gorge 5€. Entrance fee for Irini Gorge 2€. The ferry from Loutro to Chora Skafion at the end of your trip is not included. This takes 20 minutes and is currently 5€. For further information please see www.anendyk.gr. Private taxi boats may also be available. We'd recomend flying into and out of Chania which is served by budget (including Easyjet and Ryanair), charter (including Thomson Airlines) and scheduled airlines (including Aegean no-direct via Athens) from several UK airports. It is also possible to fly into Heraklion with similar airlines, although the journey to Paleochora at the beginning of your holiday is longer. At the start of your trip you can fly into Chania or Heraklion airport. It is also possible to take a night ferry from Piraeus and arrive to Chania at approximately 6.00. There are public buses from Heraklion airport to Vamos Paleochora via Heraklion and Chania bus stations. Total duration appoximately 4.5 hrs. If you arrive after midday an extra night in Chania or Heraklion will be necessary. On departure take a ferry from Loutro to Chora Sfakion (20 minutes). From here there are public buses to Chania and Heraklion. It is also possible to book a private taxi to the airports from Chora Sfakion. If you have an early flight an extra night in Chania or Heraklion will be necessary. Alternatively it is possible to return to Piraeus by ferry from Chania. On this journey you walk for 5 to 7 hours on 6 days, mainly on unsurfaced tracks, footpaths and mountain trails. The distance covered is a minimum of 92 kms (an average of 15 km per day). Tue 30 Apr 2019 - Wed 29 May 2019 Your trip can depart anytime between the above dates. Contact us for triple room requests and solo traveller prices. Thu 30 May 2019 - Sun 30 Jun 2019 Your trip can depart anytime between the above dates. Contact us for triple room requests and solo traveller prices. Tue 1 Oct 2019 - Sat 12 Oct 2019 Your trip can depart anytime between the above dates. Contact us for triple room requests and solo traveller prices. Sun 13 Oct 2019 - Fri 25 Oct 2019 Your trip can depart anytime between the above dates. Contact us for triple room requests and solo traveller prices. Wed 1 Apr 2020 - Wed 29 Apr 2020 Your trip can depart anytime between the above dates. Contact us for triple room requests and solo traveller prices. Thu 30 Apr 2020 - Fri 29 May 2020 Your trip can depart anytime between the above dates. Contact us for triple room requests and solo traveller prices. Sat 30 May 2020 - Tue 30 Jun 2020 Your trip can depart anytime between the above dates. Contact us for triple room requests and solo traveller prices. Thu 1 Oct 2020 - Mon 12 Oct 2020 Your trip can depart anytime between the above dates. Contact us for triple room requests and solo traveller prices. Tue 13 Oct 2020 - Sun 25 Oct 2020 Your trip can depart anytime between the above dates. Contact us for triple room requests and solo traveller prices.